The Enzo CELLESTIAL® product line includes robust cell based assays for measuring autophagy, aggresome accumulation, and lysosomal perturbations, all applicable to the analysis of autophagy. The CYTO-ID® Autophagy Detection Kit is a no-transfection quantitative assay for monitoring autophagy in live cells. Suitable for flow cytometry and microscopy, the assay facilitates high-throughput screening of activators and inhibitors of autophagy. The CYTO-ID Autophagy Detection Kit includes a patent-pending dye that selectively stains pre-autophagosomes, autophagosomes, and autolysosomes (autophagolysosomes), with minimal staining of lysosomes. Profile Autophagy Without Transfection. 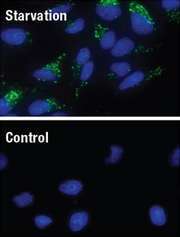 Starvation induces an increase in green fluorescence intensity as demonstrated by the presence of punctate cytoplasmic structures (top) compared to control cells (bottom). Nuclei counterstained with Hoechst dye (blue). Neuronal and autophagy detection in yeast detection.